There are several ways to buy Ohio Amish furniture. First, you can drive around all over the state, looking for Amish artisans and hope that they will sell their products directly to you. You should keep in mind that not all Amish families will do so. Second, you can go online and search for “Amish furniture” and hope that you are realistically going to find the real deal and not a scam. Or, you can do the most reasonable thing and go directly to Amish Originals Furniture Company where you will find the perfect Ohio Amish furniture for every room of your house. Why Should You Buy Ohio Amish Furniture? Hardwood furniture is more durable than particle board or pressed wood. Amish furniture building techniques have been handed down for generations. Individual furniture pieces are stronger than factory milled items. You might pay more for Ohio Amish furniture upfront, but it will end up saving you money in the long run because it will last longer than any other piece of furniture that you might buy. Once you know that it is Amish furniture that you want, you might be tempted to buy from the very first place that has the word “Amish” in its title. Did you know that there are many of these places that have nothing at all to do with the Amish culture? That is why it is important to buy your items from a company that actually does business with real Amish families. Amish Originals Furniture Company has been working with more than 70 Amish families for more than two decades, helping to provide the best furniture for their customers while also helping to provide a living for the families that build all of their furniture items. 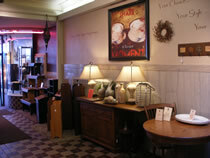 Located in Central Ohio, Amish Originals Furniture Company is not only easy to find but features ample showroom space so that you can see all of the beautiful items for yourself. Simply looking at pictures in a catalog or on a website is never enough- you will want to see the fine detail that goes into each piece and feel the real wood for yourself. You may also want to be able to measure the pieces in person so that you know they will fit where you want them to. Sure, the dimensions are listed on catalog pieces, but with real wood pieces, there might be slight variations that can make all the difference in the world if you don’t measure carefully. You know that it pays to be cautious because who wants to buy a dining room table that turns out to be entirely too big for the room? Shopping for Ohio Amish furniture should be fun, not frustrating, so shop at Amish Originals Furniture Company, the furniture store of Columbus Ohio.